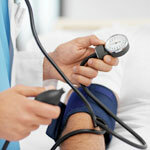 Here I begin a multi-part series on a very critical subject: your blood pressure. High blood pressure is a very serious risk factor for a litany of health problems, not the least of which is heart disease. Let’s begin with the fine points, so we can understand exactly what we are dealing with. The National Health and Nutrition Examination Survey (NHANES) tracked the prevalence of high blood pressure in the U.S. since 1960. In 2008, the NHANES data showed that the prevalence of high blood pressure was 28% to 30% in those over 18 years old. This number translated into 65 million hypertensive adults in the U.S., which was definitely much higher than the 43.2 million from the 1988 to 1991 NHANES data. Approximately half this increase is caused by higher rates of obesity. High blood pressure is categorized as primary (essential) or secondary. Primary high blood pressure, where the cause is unknown, accounts for 90%-95% of all high blood pressure cases. Secondary high blood pressure accounts for five percent to 10% of individuals with high blood pressure due to diseases of the kidneys, adrenal glands, arteries, or heart. High blood pressure, if left untreated, increases the risk of heart attacks, heart failure, stroke, aortic aneurysm, peripheral arterial disease, and kidney disease. Blood pressure measurements involve two numbers: the systolic (upper) number; and the diastolic (lower) number. These pressures are generated by the heart during contraction (systole) or during relaxation (diastole) in between heartbeats. It is well-known that each rise in systolic blood pressure by 20 mm Hg and diastolic blood pressure by 10 mm Hg over the range of 115/75 to 185/115 increases the risk of a fatal heart attack twofold. In other words, it’s quite serious. Stay tuned for tomorrow’s installment on blood pressure! In the meantime, here’s a great article on how to eat your way to lower blood pressure.